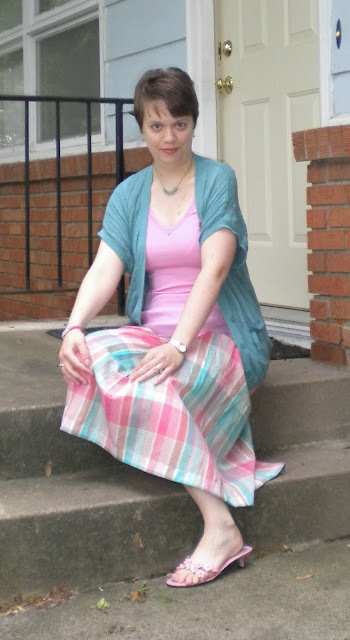 I'm finally getting around to wearing this vintage skirt I picked up when I went thrifting with Erin. I had it shortened a little bit, but not too much. I wanted to still give a vintage feel without it feeling matronly. I think it worked out pretty well. It was also a good example of "don't pay attention to what the size tag says when thrifting items" because the number is definitely not accurate to what size I'd normally buy, but it's vintage, it fits, I'm not going to complain. My shoes were in the donate pile but I rescued them at the last minute. I realized I still had plenty of things to wear them with and they still look fine, so I'd give them another summer. Anyone else ever do that? I'm also finally getting around to wearing the seahorse pin I won from Christine's giveaway. He's tiny, so you can't see him real well, but I promise he's there. Fun added touch to my sweater. I tell you, it's so worth it to enter blogger giveaways (and I'm not just saying that because I'm running one right now) - I have won so many things, I almost can't believe my luck. I will probably never win the lottery now though! It sounds like you're on a hot streak! You should totally buy a lottery ticket! I don't think I've ever won anything on a blog give-away! I have pulled lots of stuff out of the donation bag (some multiple times!). Sometimes you just need to see an item out of the closet to see its possibilities. 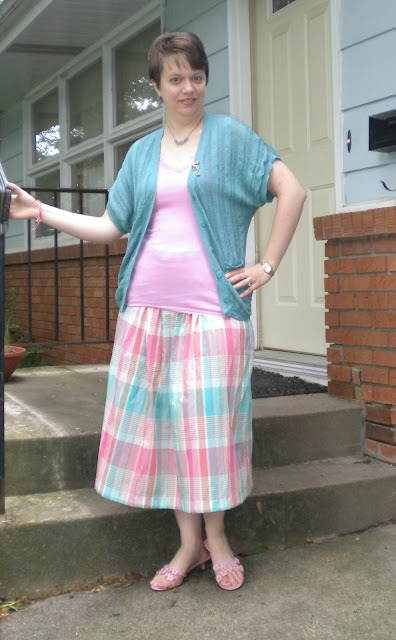 That is the perfect summer plaid with the pastel colors! I've won a bunch of giveaways so now my hubby said I need to buy lots of lotto tickets, ha. i do that all the time with my giveaway pile. it usually ends up back there at some point, though! loving the summer colors! I love pastel checks! What a lovely skirt! The giveaway thing is true- I think I've won 3 now! Aww pink plaid and a seahorse pin! So cute. That skirt is fab. I never pay attention to sizing while thrifting. I own pieces with tags that say L/Xl but they fit me, and I'm not complaining. I occasionally will miss an item after I donate it, but only in those single instances. Rarely do I consistently miss something enough to regret donating it.